Verizon officially announces BlackBerry Storm 2 9550 | BlackBerry Blast! 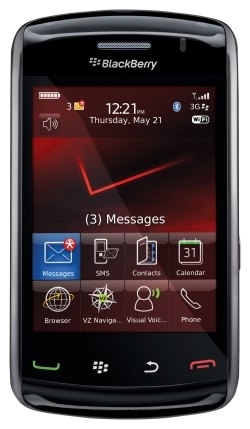 Verizon has made the official announcement via a press release, for the BlackBerry Storm 2 9550. The new BlackBerry Storm will launch Wednesday, October 28, 2009. Verizon Wireless and Research In Motion (RIM) (NASDAQ: RIMM; TSX: RIM) today announced that the BlackBerry® Storm2™ smartphone will be available in Verizon Wireless Communications stores, online at www.verizonwireless.com, and through business sales channels beginning Oct. 28. The BlackBerry Storm2 with BlackBerry® OS 5.0 evolves the BlackBerry® touchscreen platform with hundreds of hardware and software enhancements – including new SurePress™ “clickable” display technology and built-in Wi-Fi® – delivering the exceptional multimedia experience and communications capabilities customers have come to expect from their BlackBerry smartphones. The BlackBerry Storm2 smartphone is available beginning Oct. 28 for $179.99 after a $100 mail-in rebate with a new two-year customer agreement on a voice plan with an Email and Web feature or an Email and Web for BlackBerry plan. Customers will receive the mail-in rebate in the form of a debit card; upon receipt, customers may use the card as cash anywhere debit cards are accepted. Data plans for the BlackBerry Storm2 smartphone begin at $29.99 when added to any Nationwide voice plan. Existing BlackBerry Storm customers will be able to update their handsets to the new BlackBerry OS 5.0 software via Web software load (www.blackberry.com/update), BlackBerry Desktop Manager, or from Verizon Wireless’ download site (www.verizonwireless.com/storm). The software is available today. For additional information on Verizon Wireless products and services, visit a Verizon Wireless Communications Store, call 1-800-2 JOIN IN or go to www.verizonwireless.com. Business customers can contact their Business Sales Representatives at 1-800-VZW-4BIZ.